This is actually the lake side (rear) of the house but provides the best view of the structure and design. "Built in 1879 as a private summer residence for the two Schuttler brothers , The Inn at Pine Terrace was modeled on the design of a French nobleman's castle near Vienna. The original owners, wagon builders from Chicago, named their estate 'Mon Bijou' (My Jewel). In 1988, the three story mansion was restored to its original Cream-City brick exterior. The interior was also carefully renovated, with special attention paid to the hand-carved woodwork, gracious furnishings and exquisite wall coverings. "Mon Bijou remained in the Schuttler family for over forty years and hosted such notables as Mark Twain, several American Presidents, and many of the country's beer brewing elite, including the Miller, Anheuser, Busch, and Pabst families, as well as railroad and industrial barons. 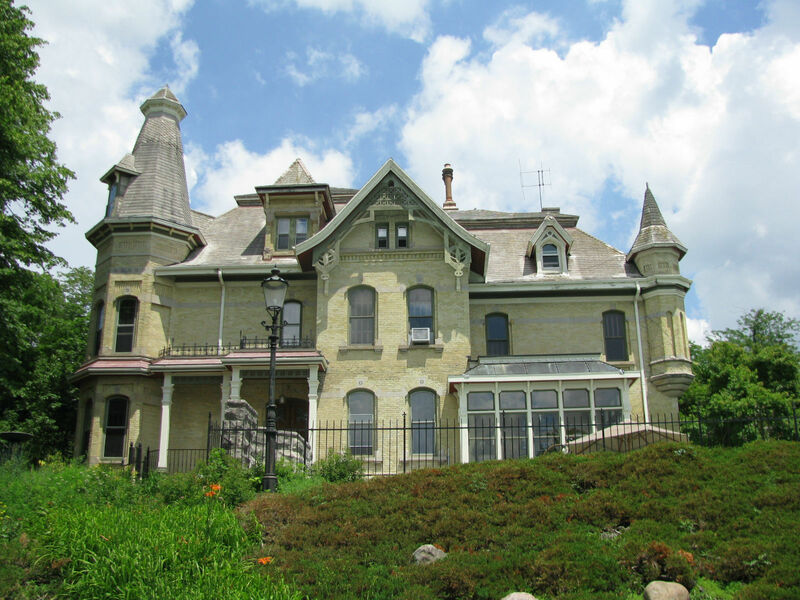 "The Inn at Pine Terrace is one of the last and largest of the Victorian mansions still standing in Oconomowoc today and is listed on the National Register of Historic Places." From the website of the Inn at Pine Terrace/a>, follow the link to read the rest of the history.